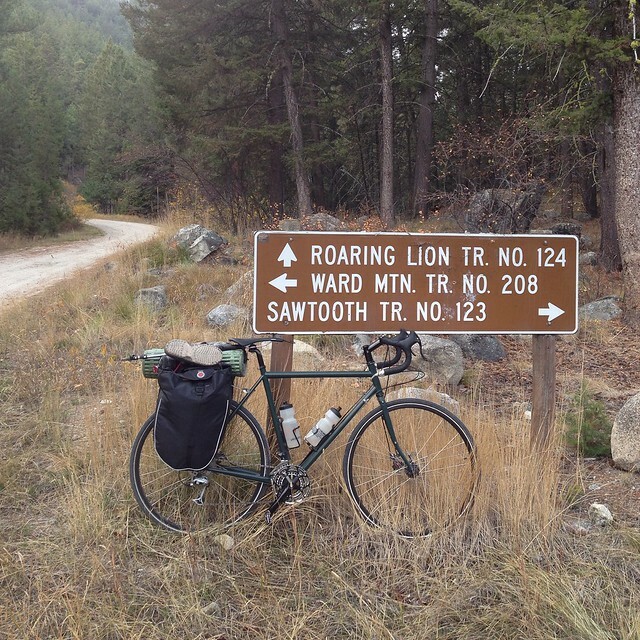 Autumn is a great time for both backpacking and bicycling, so rather than choose one or the other I decide to combine them on a quick overnight trip to the Selway-Bitterroot Wilderness. Cool temperatures on Saturday meant that I could enjoy a leisurely morning while waiting for the day to warm up and the short distance to the trailhead (about 10 miles) meant that a postponed departure wouldn’t have significant consequences. Even thought the daylight was dwindling, sunset wouldn’t occur until around 6:30 p.m. My only plans upon reaching the trailhead were to hike as far up Roaring Lion Creek as my energy and/or trail conditions allowed and set up camp. Even though I took the “scenic route”, which is somewhat of a redundancy as anywhere in the Bitterroot Valley seems to meet or exceed the minimum qualifications for scenic, I arrived at the end-of-the-road trailhead after only an hour of pedaling. It’s hard to emphasize just how gratifying it is to bike to a trailhead, so I’ll just encourage you to try it for yourself at least once in your life. After stretching my legs and a quick snack, I stashed my bike, loaded my minimal amount of gear into a frameless 35-liter pack, and sauntered down the trail. Within a few minutes I found myself in a gorgeous grove of cedars where the trail crossed the creek. The low water of October meant that the sometimes formidable ford of the creek was a simple matter requiring little effort or strategy; I arrived at the other side with dry feet and only a slight sense of accomplishment. The trail entered the Selway-Bitterroot Wilderness shortly before the two-mile mark and I took a moment to relax and reflect on the fact that in under two hours, and solely using human-powered transportation, I had gone from my apartment to the threshold of the third largest wilderness area in the Lower 48. Pondering this fact made me feel even more fortunate than I usually feel. Knowing that I had the gear to comfortably spend the night and a tasty meal to cook in my backpack further increased this sentiment. 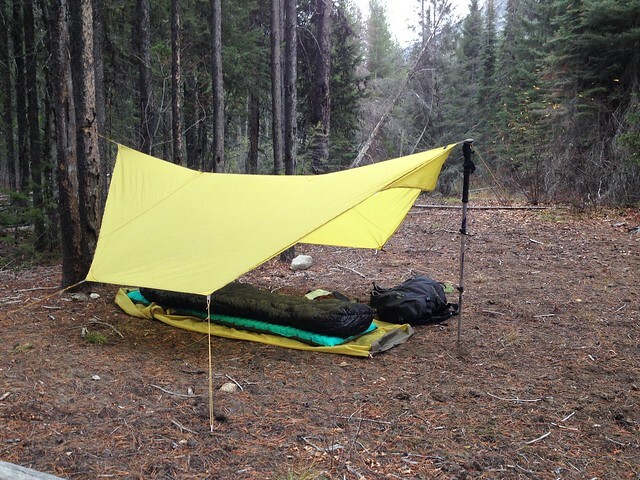 Since I’d biked to the trailhead and the forecast was mild (lows around freezing with a slight chance of showers) I went lighter than I usually do on the gear, bringing a tarp for shelter rather than a tent and the lightest sleeping system I could justify. 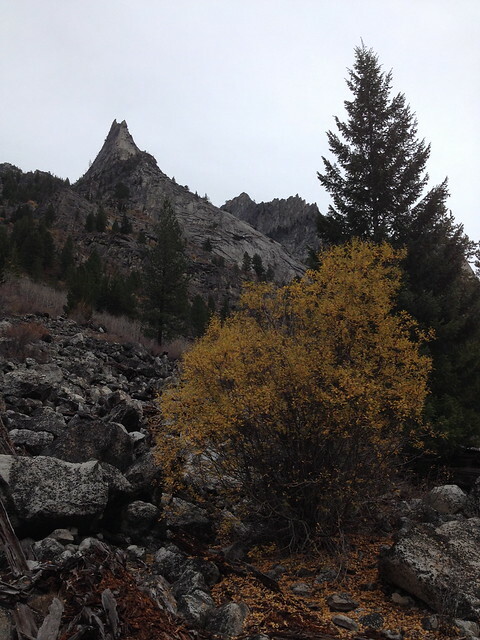 For the next few miles the trail alternated between pleasant forest dominated by one evergreen species or another and talus slopes that stretched up to the base of stunning granite crags. 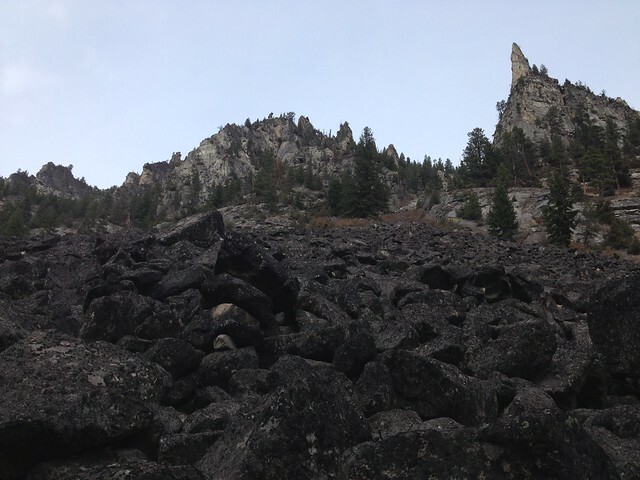 Spires, sheer cliffs, and fins were the backbone of the ridge that separated Roaring Lion Canyon from Sawtooth Canyon to the north. 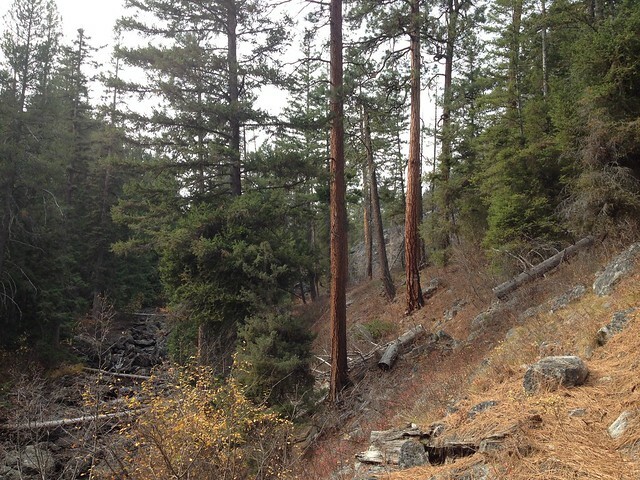 Trees clung to unlikely ledges and dotted the uppermost reaches of the crags. Even with a light load on my back (perhaps around 18 pounds), once the trail conditions began to deteriorate — become less distinct and with increasing amounts of downed trees — making forward progress became more of a chore than a task. After I missed the second creek crossing, despite careful consideration of my map and what I thought was above-average situational awareness and intuition, I decided to backtrack to a small campsite I’d passed rather than stubbornly push on towards the head of the canyon. The campsite was a small clearing in a rather scraggly stand of lodgepole pines beside a bend in the creek and lacked a fire ring, which to me isn’t necessarily a bad thing. I dropped my pack and strung up my tarp, answering the question of where I would lay my head that night. Once the tarp was up, the sleeping pad inflated, and the sleeping bag laid out to loft, I attended to hanging the bear bag line and purifying water. I was using a Steripen on this trip, mainly for the weight savings. 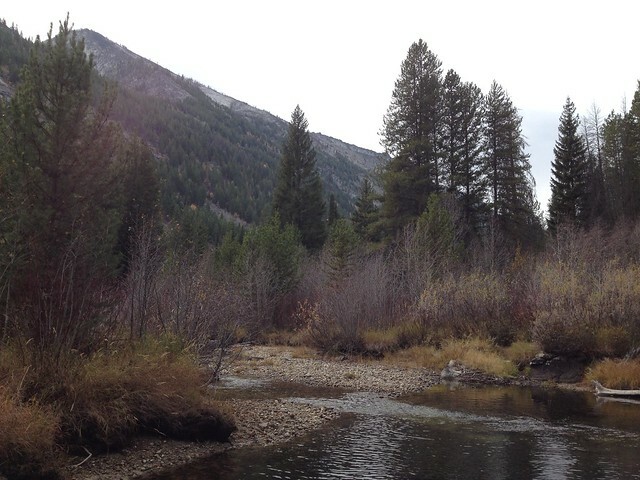 On a trip earlier in October to the Anaconda-Pintler Wilderness with my friend John we experienced a minor malfunction with the Steripen (entirely due to our miscalculation on the battery life) which led to it receiving the nickname “Scarypen”. That incident aside, the Steripen will probably be my main method of treating water on backpacking trips unless conditions dictate otherwise (such as when winter camping and boiling snow). Iodine tablets will serve as a back-up. Just as twilight transitioned into night I began eating my dinner (past and tuna, with fresh spinach and mushrooms tossed in). By the time I was sliding into my sleeping bag a nearly full moon had risen, casting a delightful monochromatic glow across the forest. Roaring Lion Creek more closely resembled a cat softly purring as water conspired with gravity and skittered across the rocks, creating a perfect soundtrack for a night of rest. I slept soundly, awakening only to put on my down jacket and socks during the coldest part of the night. I enjoyed sips of coffee from the comfort of my sleeping bag just as sunlight began to illuminate the floor of the canyon. A light rain had fallen overnight, although I wasn’t aware of it as it was happening. It was only noticeable by the contrast between the damp ground outside of the tarp and the lingering moisture on the tarp itself. Packing up was accomplished within a few minutes and I left the campsite at about the same time I’d usually be arriving at work. The hike out was as pleasant and uneventful as the hike in, and “pleasant and uneventful” is actually a decent summary of the all-too-brief trip in general. The damp forest seemed to be saturated with both moisture and color, as the colors of fall still lingered in places. 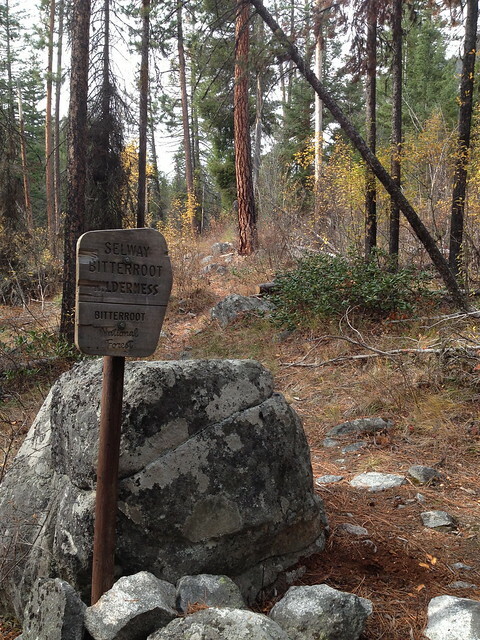 I arrived back at the trailhead, empty when I started and empty when I returned, about 24 hours after I’d left. The ride back home was chilly but enjoyable, especially since the first few miles were almost entirely downhill and the miles that remained were pretty flat. There were no great epiphanies or epics on this trip, but it was a great way to spend my 38th night of the year outside.